[wptab name=’Description’] USB over IP devices are used to share USB drives on the network. The devices would contain a network port and single or multiple USB Ports. These devices are mainly used for sharing USB drives on the network. The network port on the device connects to the existing network and the USB drives are connected to respective USB ports. The systems on the network would be installed with custom software application which comes along with the device. The below diagram shows the device. USB over IP devices can be setup on a home network for sharing single or multiple USB drives on the network. 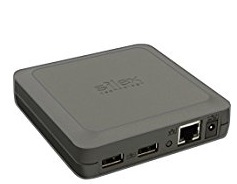 The network port available on the device can be connected to any of the ports available on the wireless router and an IP address configured. The USB drives can be connected to the ports available on the device and accessed from respective systems. The device can also be used in small office network, where multiple USB drives needs to be shared on the network.